Chat - Dictionnaire Visuel - Copyright © 2005-2016 - Tous droits réservés. 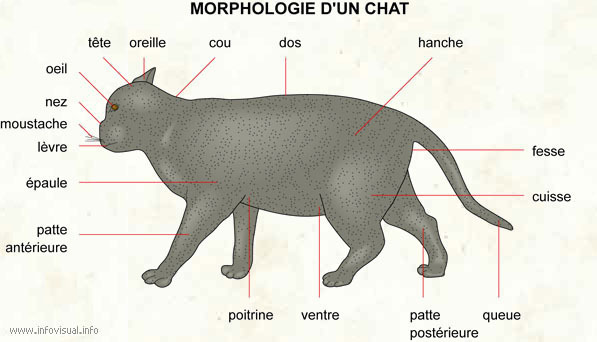 [img]https://infovisual.info//storage/app/media/02/img_fr/065 Morphologie chat.jpg[/img] [url=https://infovisual.info/fr][/url] - [url=http://www.infovisual.info/]Dictionnaire Visuel[/url] - Copyright © 2005-2016 - Tous droits réservés. The name Bengal was derived from the taxonomic name of the Asian Leopard Cat (ALC), as shown above, and not from the more widely known Bengal tiger species, which is unrelated to the Bengal's ancestry. The Bengal cat is a relatively new hybrid breed of cat developed to have a gentle and friendly temperament, while exhibiting the markings, such as large spots, rosettes, and a light/white belly, and body structure reminiscent of the wild Asian Leopard Cat (Prionailurus bengalensis). In other words, a Bengal cat has a desirable "wild" appearance with a gentle domestic cat temperament, provided it is separated by at least 3 generations from the original crossing between a domestic and Asian Leopard Cat. The Bengal is a large breed - weighing between 7 to 20 pounds (lb) (3.2 kg to 9.1 kg). Male cats are generally larger than females. The face of a typical Bengal features a series of distinct horizontal stripes, popularly known as "mascara", which extend from alongside the eye to the back of the neck. The sides and top of the body are marked with spots, usually rosetted like those of the jaguar. The remainder of the body - including the legs and tail - consists of symmetrical stripes. Bengals can have either spotted or marbled coat patterns. Spots with at least two colors present (rosettes) are particularly desirable. The following colors and patterns are recognized and eligible for competition: Brown Spotted Tabby, Brown Marbled Tabby, Seal Sepia Spotted Tabby, Seal Sepia Marbled Tabby, Seal Mink Spotted Tabby, Seal Mink Marbled Tabby, Seal Spotted Lynx Point and Seal Marbled Lynx Point. Silver was also recently accepted as a color variation eligible for championship status. Blue and Melanistic (black) are additional colors that occur, but are not yet recognized by most associations that accept the Bengal breed. Bengal cats are the only breed of cat which displays the gold or pearl dusting effect usually called glitter. Its pelt has a rich smooth satin or silk feel. Even the voice of the Bengal is different from that of other domestic cats. Males and females are extremely vocal. Life expectancy is 12-16 years. Bengal cats are a hybrid breed developed over several generations through a program of selectively crossbreeding domestic cats, possessing desired features, with Asian Leopard Cats and ALC hybrids. In the first three generations, males are almost always infertile (by Haldane's rule), though there have been the occasional, but rare F3 studs capable of reproduction. Early generation females are typically fertile, and responsible for continuing the genetic contributions of the ALC to the next generation. The modern SBT Bengal gene pool contains genes sourced from many varieties of domestic cats - mainly Egyptian Maus, American Shorthair, Abyssinian, Ocicat, and domestic shorthaired cats. It is commonly accepted that the breed was developed by Jean Mill of California in the 1970s; today, Bengal breeders exist throughout the world. Many breeders are presently working to develop specific characteristics in the breed, often by backcrossing foundation cats with particularly vivid markings. The ALC comprises several subspecies, and consequently, they can have considerable variations in their appearance. The first three filial generations (F1 - F3) of these hybrid animals are referred to as the "foundation" generations. A Bengal cat with an ALC parent is called an F1 Bengal, short for first filial. An F1 then bred with a domestic male yields an F2, or second filial. Kittens from an F2 female and another domestic cat are then termed F3. Kittens from a subsequent F3 mating with a domestic are F4s. The F4 and later generations are considered domestic cats, are designated as Stud Book Tradition (SBT) Bengals, and can be shown and registered. Any SBT Bengal is at least four generations removed from the ALC. Founders (F1-F3) are typically reserved for breeding purposes or the specialty pet home environment.